2 tablespoons ghee or coconut oil. 1.5 kg chicken thighs, diced. 1 tablespoon low-sugar tomato paste. 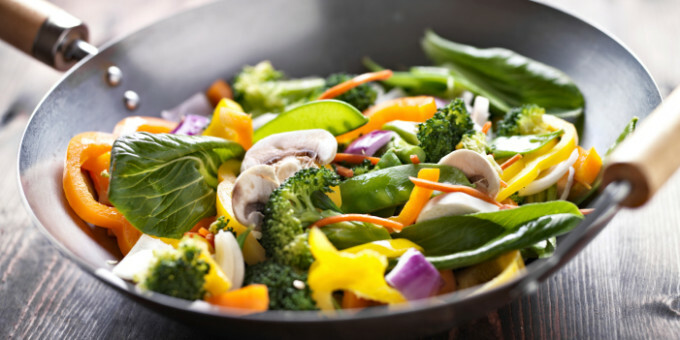 Add ghee or coconut oil to a hot pan. Add the diced chicken in batches and cook until nearly cooked through. Set chicken aside. Add the garlic and ginger to the leftover oil in the pan and stir until fragrant. Add in the spices and stir until fragrant. Then add the tomato paste and mix until a thick paste forms. Place the chicken back in the ban and coat in the spices. Pour in the diced tomatoes and coconut cream and stir to combine. Allow to simmer for 10 minutes. 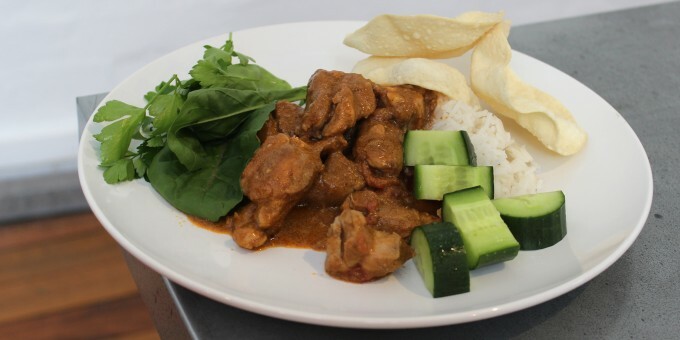 Serve with basmanti rice, chopped cucumber, leafy greens and papadams. 1/2 cup uncooked basmati rice. 1 small (150g) red onion, finely sliced. 4cm piece of ginger, cut into matchsticks. 1 small (170g) red capsicum, sliced. 1/2 cup finely sliced button mushrooms. 1 small (250g) head of broccoli, cut into florets. 50 g snow peas, trimmed. 1 bunch Pak choy, washed, ends trimmed. Cook rice according to packet directions. Drain. Meanwhile, combine garlic, lime juice and tamari. Set aside. Heat coconut oil in a large wok. Add onion and ginger and stir fry for 2 minutes, or until softened. Add capsicum, mushrooms and broccoli. Stir fry for 2 minutes. Add tamari mixture. Stir fry for a further 1 minute then add snow peas, Pak choy and herbs and stir until just wilted. Divide rice and stir-fry between a plate and a container. Sprinkle with cashews. Place container in the fridge to enjoy for lunch tomorrow. 400 g pumpkin, cut into thin wedges. 40 g (1/3 cup) walnuts, roughly chopped. 1 small handful flat-leaf parsley, roughly chopped. 640 g chicken thigh fillets. 3 cups baby English spinach. Pour 2 teaspoons of the olive oil onto a baking tray and place in oven for approximately 3 minutes to heat oil. Remove tray and, while oil is still hot, toss through pumpkin to coat on all sides. Return tray to oven for 15 minutes. Reduce heat to 180°C and cook for another 15 minutes, until pumpkin is tender. Meanwhile, in a small bowl, combine walnuts, parmesan, parsley, lemon juice and pepper. Heat a grill pan to hot. Brush chicken thighs with remaining oil and sear in batches for 2 minutes on each side. Transfer to a baking tray lined with baking paper and spoon some walnut mixture over each thigh fillet. Place baking tray in oven with pumpkin for the last 15 minutes of cooking. Toss spinach through pumpkin so spinach wilts; season with a little salt. 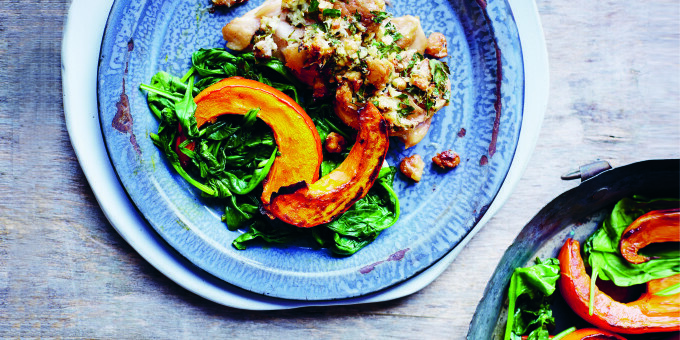 Serve chicken with the pumpkin and spinach. 2 X 400 ml tins coconut milk. 2 X 400 ml tins tomatoes. 2-3 cm piece of fresh ginger, peeled and grated. 1 large (1kg) butternut squash. handful of fresh coriander, finely chopped. 1 X 400 g tin chickpeas, drained. 3 teaspoons brown miso paste. salt and freshly cracked black pepper, to taste. Preheat the oven to 200°C (fan 180°C). Put the coconut milk, tinned tomatoes, grated ginger and chilli into a large saucepan or pot with a sprinkling of salt and pepper and allow it to heat until boiling. As it heats up, peel the squash and cut both the squash and the eggplants into bite-sized pieces. Add these to the coconut and tomato in the pan. Place in the oven and allow the mixture to cook for about 30 minutes. Then, add the coriander and chickpeas to the pan with the miso and place back in back in the oven for 30 minutes. It’s ready when the squash is soft. 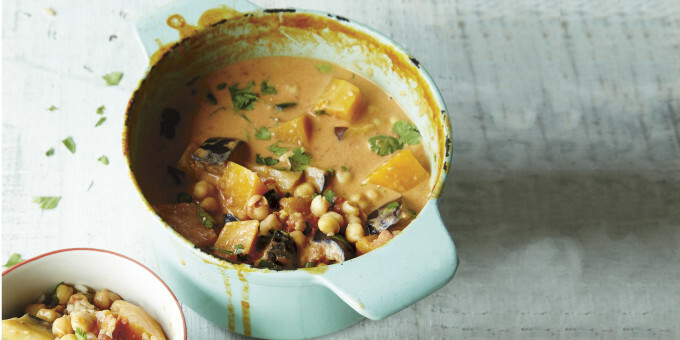 Serve the coconut curry with the brown rice. Store any leftovers in an airtight container in the fridge or freezer. 2 teaspoons rice malt syrup. 1 1/2 tablespoon olive oil. 2 teaspoons coarsley chopped rosemary. 800 g (1 lb 12 oz) pumpkin, seeded and cut into wedges (see note). 2 teaspoons red wine vinegar. 250 g broccolini, trimmed (about 2 bunches). 400 g (14 oz) tin borlotti beans, drained and rinsed (see note). 1 head radicchio, trimmed and leavs torn. 2 tablespoons lightly toasted hazelnuts, coarsley chopped. Preheat the oven to 200°C (400°F). Line a large baking tray with baking paper. Combine half the rice malt syrup with 1 tabelspoon of olive oil and the rosemary in a large bowl. Add the pumpkin and toss to coat. Place on the prepared tray and roast for 30–40 minutes or until golden, turning halfway through the cooking time. Meanwhile, combine the remaining rice malt syrup and oil and the vinegar in a small bowl. Set aside. Cook the broccolini in a saucepan of boiling water until just tender. Drain. 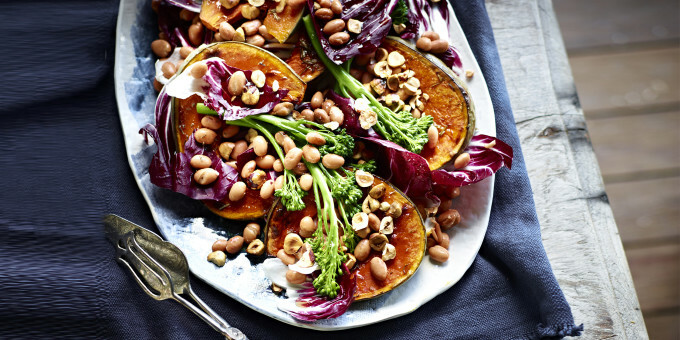 Combine the pumpkin, broccolini, borlotti beans, radicchio and hazelnuts in a large bowl. Add the sweet dressing and gently toss to combine. Season to taste with sea salt and freshly ground black pepper. 1 small punnet of cherry tomatoes or 2 large tomatoes (chopped). A couple of glugs of olive oil. Roughly chop the broccoli and add to a food processor. Pulse until you have a rice like consistency (don't chop too finely). Cook in a pot of salted boiling water for 2 minutes. Drain and press out as much of the water as possible. Add to a bowl to cool and dry. Next chop the parsley, coriander and mint quite finely and add to the broccoli mixture along with the tomatoes. Dress with then lemon juice, oil, salt and pepper. Serve. Slow cookers are wonderful things. They make feeding your family a cinch. 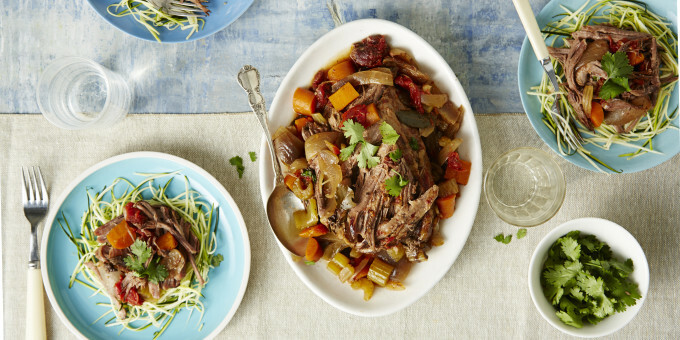 This beef brisket is coated with traditional Italian flavours but it’s served on a bed of zucchini noodles for something a little bit different. Cook it up and you’ll have melt-in-your mouth leftovers to add to casseroles, sandwiches and salads for the rest of the week. 1-1.2 kg beef brisket, fat removed. 3 carrots, halved lengthways and roughly chopped. 2 red onions, cut into wedges. 3 sticks celery, roughly chopped. 1/2 x 400 g can diced tomatoes. 4 large zucchinis,peeled into ribbons using a peeler or mandolin. Place meat in the base of the slow cooker insert. Add the remaining ingredients (except for the parsley and zucchini) on top and around the meat. Season with salt and pepper. Cover and cook on low for 8-9 hours or high for 4-5. 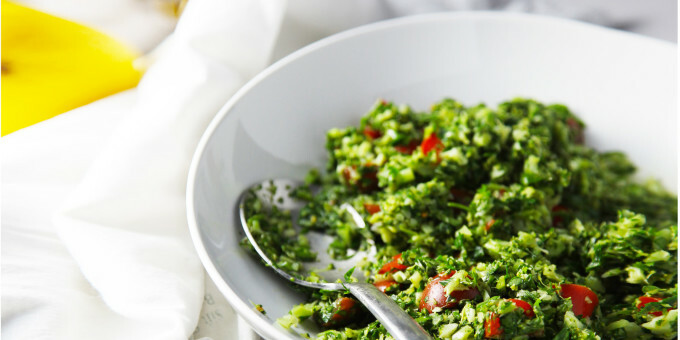 Serve on a bed of zucchini ribbons and sprinkle with parsley. Steam or boil cauliflower (optionally with a clove of garlic) until tender. 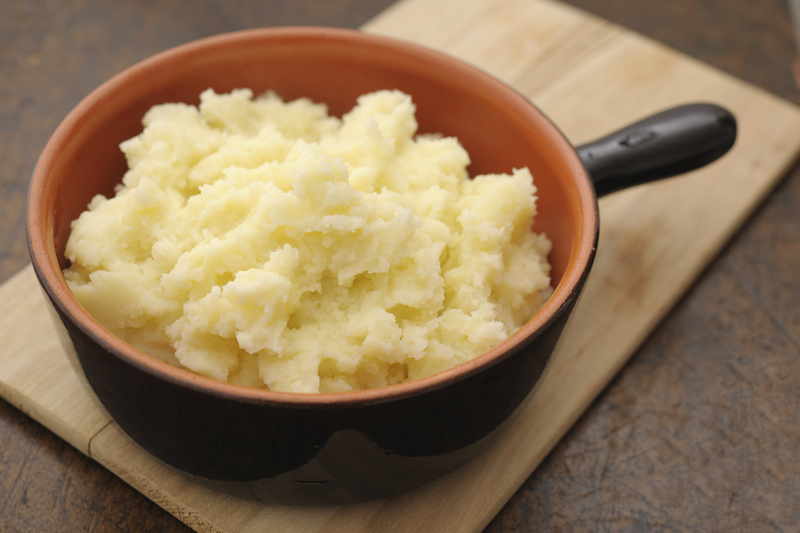 Cut the cauliflower into pieces and place in a blender with the milk, yogurt or butter. Season with salt and pepper and whip until smooth. To save time, you can use a hand-powered immersion blender. Pour cauliflower into small baking dish, sprinkle with paprika and bake in a 400 degree oven until bubbly.